Did you know that there are 44 million active social media users in the UK? That's 66% of the country's population. Module 3 Content Outreach You’ll be introduced to the concept of content seeding and how to use content effectively over multiple social platforms. You will acquire an understanding of how to promote content and the importance of paid promotion for relevant, highly sharable content. Module 8 Social Video The Social Video module will introduce you to the concept of social video marketing. Focussing on YouTube, you will learn how to leverage the creative life cycle for audience development and advertising in order to build sustainable communities for lead generation. Our certifications deliver best current practise, theory and applied skills in digital, and are recognised and respected across the industry. Do I need to have a digital marketing background?How much is the social media marketing course?Who should take this social media course?Where will my qualification be recognised?How is the Social Media Marketing Certificate assessed? The Specialist Certificate in Social Media Marketing is suitable for people who are responsible for the planning, execution and management of social media campaigns. Social media specialists, enthusiasts, executives or anyone who would like to enhance their digital marketing knowledge base in this area would excel on this course. 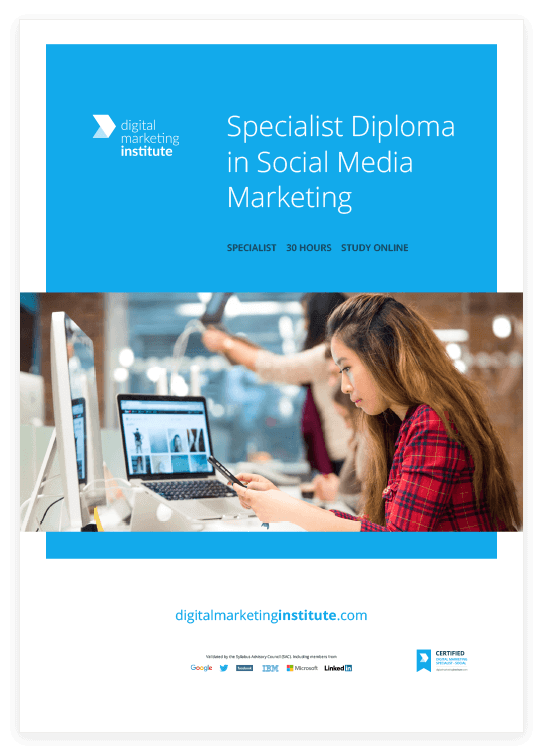 This specialist certificate is suitable for any level of skills or experience and is designed to prepare you to engage specifically with social media marketing within an overall digital marketing domain. How is the Social Media Marketing Certificate assessed? The Specialist Certificate in Social Media Marketing is assessed by one three hour exam. These are administered by our computer-based testing partner, Pearson Vue, via its global network of test centres. Candidates need to achieve a minimum of 60% to pass the exam. Delivered by industry leading experts, you will be introduced to the most relevant aspects of social media that will excel your career. Our specialist product team works closely with leading industry experts to create, review and update the learning outcomes on a regular basis. Membership: Stay Connected. Stay Relevant.